We often speed through life, trying to keep pace with our never-ending list of to-do’s. Even special events tend to turn into another chore. And, with the advent of smartphones, people can literally stay connected 24 hours a day wherever they are…making it hard to stop, relax, and unwind long enough to enjoy the moment. But special occasions aren’t just about celebrating something. Enjoying the companionship of a friend, family member, co-worker or potential client can all qualify as opportunities to relax and mutually enrich and refine the experience by choosing a special drink to honour the event. We all have our regular alcoholic beverages that we typically drink when celebrating special occasions and relationships. For some it’s a nice glass of wine, for others it’s a special kind of beer or hard alcohol, like an expensive aged whisky or distilled vodka. What’s not typically on the list is Tequila…which has a reputation as a go-to drink for when you really want to party. Tequila shots, in their various forms, often speak to a need to really let your hair down and get busy with the goal of having a good time. Just a note, that to be called a Tequila, the spirits must be distilled in Mexico, made of blue agave and bottled between 62-110% proof alcohol. People generally consider tequilas made with 100% blue agave to be the best tequila, but many are made with as little as 51% agave (other sugars being used for the balance). But 1800Tequila has a surprise for you…there is such a thing as top-quality exclusive Tequila that can be considered roughly equivalent to a malt whisky or other superb beverages that are aged and distilled for long periods. Top-quality Tequila doesn’t have to age for as long as premium whiskies from Scotland or Ireland, because Mexico (where Tequila is made), has a much warmer climate than most of the world’s key whisky-producing regions. In general, a top-quality Tequila that’s been aged for up to three years can be considered roughly equivalent to a malt whisky that has been aged for 10 years or longer. The same is true of rum aged in the Caribbean. 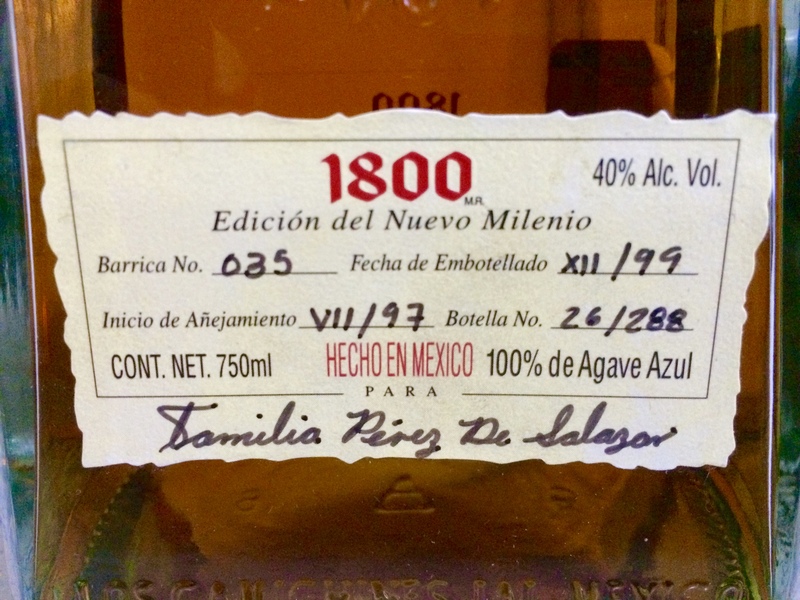 A close friend of ours recently gifted us with a 750 ml bottle of 1800 Gran Reserva Tequila Anejo – Edicion del Nuevo Milenio ( No. 26/288). All I can say is what an amazing gift – Now we had the opportunity to explore one of the finest Tequila’s ever made. A bit of history about 1800 Tequila…it’s a brand of tequila owned by the Beckmann Family, who also own the Jose Cuervo brand. The 100% blue agave tequila is bottled in Jalisco, Mexico. 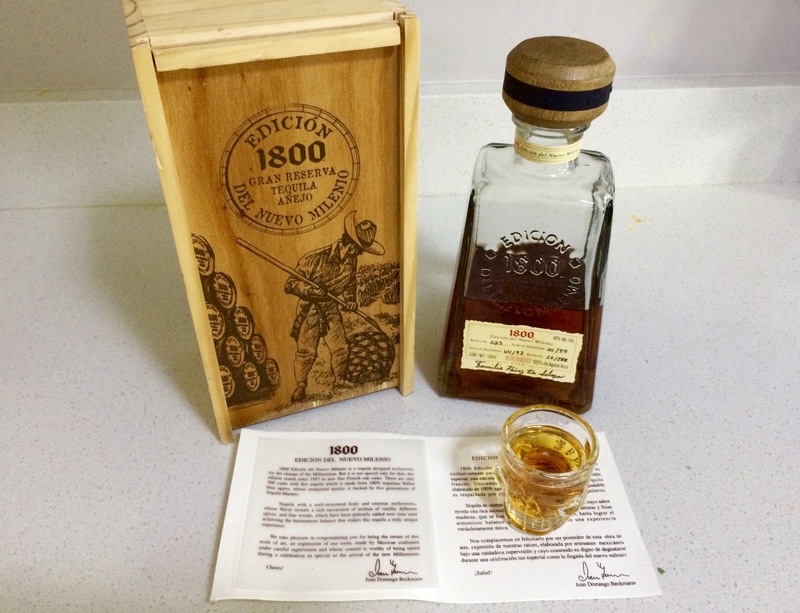 1800 is named after the year tequila was first aged in oak casks, and is sold throughout the world. Originally known as Cuervo 1800 Tequila, 1800 Tequila was launched in 1975 as a premium sipping tequila. Now, back to the bottle of double distilled 1800 Gran Reserva Tequila Anejo Tequila. Made from 100% Tequilana Weber Blue Agave; it is proudly promoted as an exclusive (only 288 made) special edition 40% Tequila which rested in French Oak casks for 3 years. Our bottle was #26 of 288 produced. Firstly, although the price of a single 1 oz shot clocks in at roughly $140 CAD ($100 USD), it’s depth of flavour, softness and complexity is quite astounding for a tequila, so this is a true connoisseur’s treat. 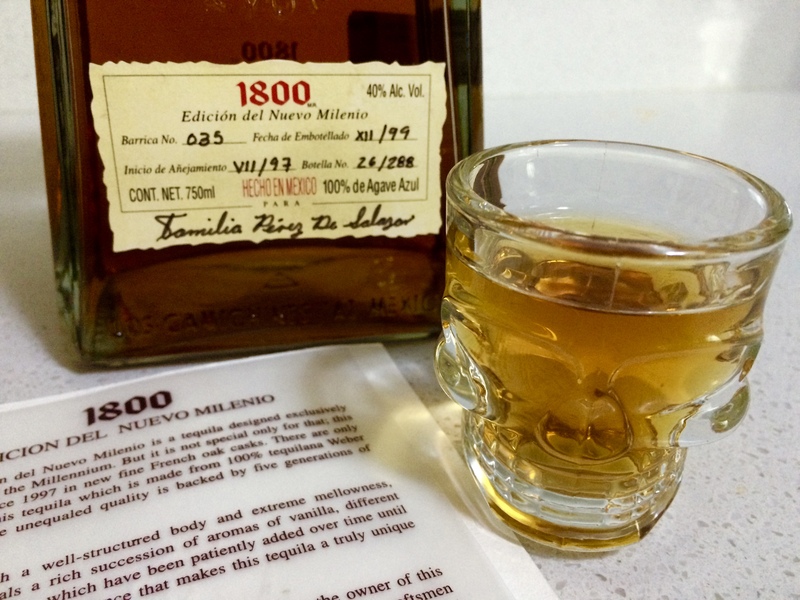 Typically you expect a strong burn when sipping a 40% shot of Tequila, but the 1800 Milenio’s creators have managed to produce a smooth mellow tasting spirit that simply tingles and warms the back of your tongue accompanied by an initial fine oaky flavour complemented by its dark amber-gold colour. It’s double distillation and three years in French Oak casks is quite apparent on the nose and is followed by a gentle hint of vanilla and spices. In reading the online reviews of this superb Tequila, I came across a perfect real-world example that fits how it can complement and mark a special occasion. 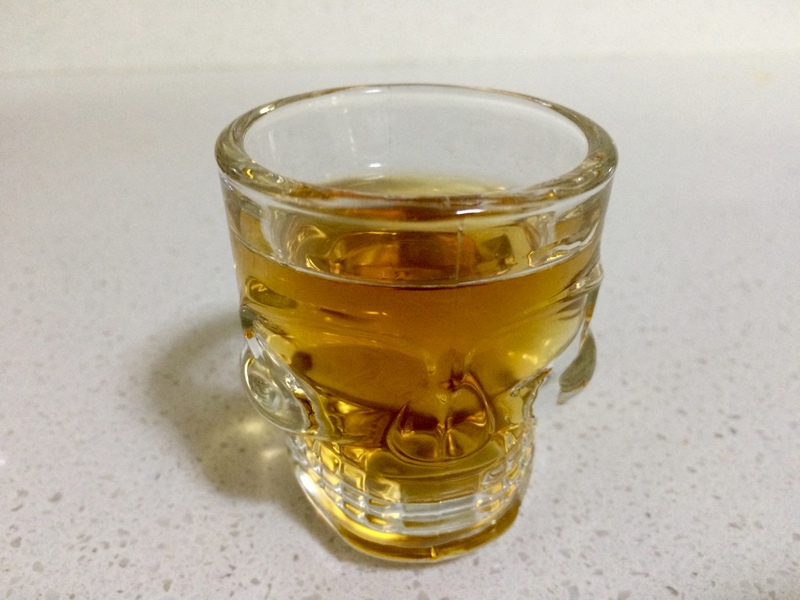 I can’t think of a better way to honour the special memory or relationship than by toasting with a shot of 1800 Tequila.